<—– Scroll down the page to see the map! What makes the OIT doctors so special? Not only are the credentialed leaders in their field, they are compassionate human beings and parents themselves. They love to free children from allergies: whether it’s through a successful food challenge because an allergy was outgrown or a false positive, or through oral immunotherapy as a way to desensitize a patient to their allergens. Many patients are able to freely eat their allergen as a result of OIT, while some only go as far as “bite-proof” protection from cross-contamination or accidental ingestion. How did this parent-defined “doctor list” of OIT allergists develop? Liseetsa Mann started keeping a list back in 2009 when she was searching for an allergist to treat her son. “I just wanted to make an appointment.” At the time she did only knew of Dr. Wasserman in Texas and then Dr. Nash in North Carolina, who came out of leading the Duke trials under Dr. Burks and set up private practice in 2010. She did not know that Dr. Mansfield and Dr. Baker were already also doing OIT. For a total of 4 doctors in 2010. To 20 by 2014, 70+ in 2016, and now over 100 in 2017. Liseetsa’s quest to help her son turned into a passion and advocacy so that other parents could find OIT for their food-allergic children. It’s all pro-bono–not a cent has been made from any doctor or practice. Just the unrelenting gratitude and respect from parents and kids for changing their lives. These doctors have full and thriving practices, many have waiting lists for OIT. They do not “need” approval, endorsement or recommendations from a group of food allergy moms like us! We could go away tomorrow and OIT and their practices would still be thriving. You can read more about Liseetsa’s journey here: About Us. More importantly, just look at the doctor’s bios and decide for yourself. Review their credentials, read testimonials, review media stories about them, call them, go for an appointment, read reviews and decide for yourself if this is a doctor worthy of working with you and for you to treat your child. You don’t need US (unless you want additional support and camaraderie)–you just need an amazing, board-certified allergist who has trained to treat food allergies via OIT. Just make a consult appointment and see for yourself. 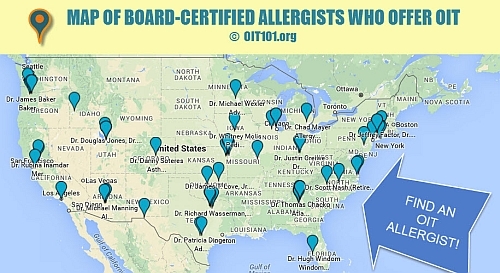 How does a doctor make our “list” of board-certified allergists found on this OIT 101 site? In any profession there are sub-specialties and areas of interest and expertise. There is a respect among peers–other board-certified allergists. In our “non-medical” opinion, as parents, some allergists shouldn’t even be offering OIT because they have unsafe practices or protocols, or their office staff is not prepared to take care of patients with the diligence required. We do not let them on our Provider List. 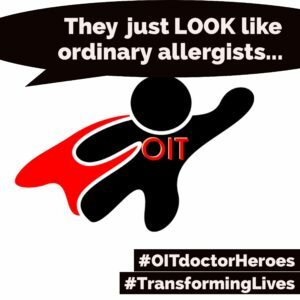 There are hundreds of allergists interested in OIT but have no clue of process, insight, experience, time, etc that is required. Anyone can design a protocol, it’s knowing what to do with it that is essential. A Do-It-Yourselfer (DIY) parent is asking for trouble and should never attempt OIT on their own. We have neurosurgeon parents in our groups who at first think OIT might be something they could administer to their children, but after one consult with an OIT allergist, they quickly understand “Anaphylaxis and Immunotherapy” are NOT their specialty. Thankfully, they realize their children’s care should be in the hands of a trained, expert allergist. All doctors on our list have to be board-certified allergists, prioritize safety, and conduct their business in a similar outstanding manner as our other OIT specialists. This applies to patient care and courtesy–even how they answer the phone and try to help. When treating a life-threatening allergy, you need to know you can make a call to the office and be treated with courtesy, respect and knowledge. If there is conflicting information about whether a doctor is appropriate to add to the list, Liseetsa will ask 3 of the OIT doctors to determine if that doctor should be on the list. Liseetsa must be able to contact the doctor in case one of our members has an issue and asks for her help with the office. If they are not willing to make themselves available to patients when treating a life-threatening condition that has risks, they are not “team players” and not the sort of doctor who would be on our “favorites” list. It’s too much of a risk. We have removed offices from the list after repeated patient complaints that were not addressed. Others in the food allergy community don’t like Liseetsa’s personal list of preferred board-certified allergists. They think that parents should be able to go to a doctor and make the determination if that doctor is “safe” and the OIT protocol well-crafted. And of course, this is America and you can go where you want to go! However, you should know that OIT is complex, and doctors have been removed or Liseetsa has refused to add them because patients had problems. So if you feel you are qualified and experienced enough with OIT and know what you are looking for, then just ignore this list and Google “OIT” and pick a doctor. We really are just a starting point for whatever health care decisions you choose to make. 1. Find a Board-Certified Allergist & Immunologist who is well-respected by professional colleagues in the community. Even though OIT physicians are sometimes considered to be avant-garde in their approach, good clinicians will always have an excellent professional reputation among their peers. 2. Ensure that your physician not only understands the complexities of food allergies and various treatment modalities (OIT and otherwise), but also offers a comprehensive approach to managing co-morbid conditions such as eczema, environmental allergies, and asthma. Food allergies cannot be successfully treated in isolation. 3. Confirm that you and your child feels comfortable with your physician’s practice style and bedside manner. 4. Make sure you are comfortable with the protocol for contacting the office in the event of an adverse reaction. Some offices use an answering service, others use private cell phone and text messaging. My allergist says he/she offers OIT and they are not on this list. What do I do? Our list has grown from 4 allergists to over 60 because parents find them and let us know! Or sometimes the doctors find our Facebook groups themselves from patients or from our current OIT allergists who are training and mentoring them. Yes, the doctors communicate and work together behind the scenes. They train each other over periods of months. It’s a whole hidden set of activity patients do not see. We are happy to add new allergists to the listing! Join the Facebook groups and message us with their info, or use the Contact Us form. With over 10,000 parents this is how it works and it works well. OPEN THE MAP IN ANOTHER WINDOW! An allergist is a licensed physician specially trained, skilled and experienced in the diagnosis and treatment of allergies, asthma and related immunologic disorders such as hay fever, hives and eczema. The effective treatment of allergic disorders must be solidly based on advanced training. The training of an allergist involves at least 9 years of intense study–4 years of medical school, followed by 3 years of training in internal medicine or pediatrics, plus 2 more years of specialized training in allergy and immunology. As a result of this extensive study and training, an allergist is the best-qualified medical professional to effectively manage the comprehensive needs of patients with allergic disease. Continuing medical education is essential to maintaining competence in this specialty, where advances in knowledge are proceeding at a fast pace. The allergist must spend many hours reading medical journals and attending clinical conferences. Many allergists are members of the American Academy of Allergy, Asthma & Immunology (AAAAI) and/or the American College of Allergy, Asthma and Immunology (ACAAI), which helps them keep abreast of latest developments in the field. Copycats and opportunists can be found in any field and walk of life. When it comes to life-saving medical treatment, we must be careful. Never let anyone other than a board-certified allergist try to treat someone with food allergies. Use this handy tool from “Certification Matters” to check the credentials and license of your provider. You can also check for membership in the American Academy of Allergy, Asthma & Immunology (AAAAI), a professional organization with more than 6,800 members in the United States, Canada and 72 other countries. This membership includes allergist / immunologists, other medical specialists, allied health and related healthcare professionals—all with a special interest in the research and treatment of allergic and immunologic diseases. Which food allergies do these board-certified allergists treat with OIT? Foods with established OIT protocols include: peanut, egg, milk, tree nuts (including almond, Brazil nut, cashew, hazelnut, macadamia nut, pecan, pistachio, pine nuts, and walnut), barley, wheat, buckwheat, corn, soy, sesame, and fish/shellfish. Others include: adzuki bean, anetto, asparagus, banana, black bean, black eyed pea, cannellini bean, chickpea, coconut, fava bean, fenugreek, green bean, green pea, kidney bean, kiwi, lentil, lima bean, lupin, mung bean, mustard, onion, pinto bean, poppyseed, sunflower seed, and tamarind. Use our SEARCH feature at the top of each page to find your food allergen and a doctor. You can also check membership in the American College of Allergy, Asthma and Immunology. ACAAI is the premier organization for over 6,000 practicing allergists, immunologists and health care professionals.